Wow it has gotten really hot here in Texas as we’ve had temperatures in the 100’s the last several days with the heat index being hotter. When it gets hot like this dehydration can happen quickly even if in a barn from sweating, and also from not drinking enough water so when it gets hot like it is now I use DynaSpark and DynaPro. A few years ago my friend and I were at a show, her horse got over heated would not drink, was hanging her head and was lethargic. We gave the filly some DynaSpark mixed with the DynaPro and within 15 minutes she was drinking and back to normal. 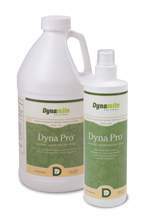 The DynaSpark encourages water consumption and the DynaPro is great for the gut as it maximizes digestive efficiency . The gut is one of the first things that suffers in horses who stand out in the heat and of course mine will stand out in the heat even though they have shade to get under. If a horse is not drinking I never add salt to their grain as it is not balanced and can really throw off their electrolyte balance so that is why I use DynaSpark as it is a balanced profile. I also at times will put just a touch in their water as it helps to encourage drinking but you might want to have 2 buckets one with and one without the DynaSpark so they have a choice as horses know what they need. Be sure to take care of yourself also and stay hydrated when working out in the heat. I mix the following for my sports drink: NTM salt (never use white iodized salt), a few drops of Elixir along with a little DynaSpark. A friend of mine’s son uses the following for his sports drink: Celtic Sea Salt into the water (¼ tsp. per quart) a squeeze of fresh lime and a few drops of raw natural honey. Remember it only takes 17 minutes of moderate intensity exercise in hot, humid weather to raise a horse’s temperature to dangerous levels. You can cool your horse 2 degrees in 10 minutes by pouring on water, scraping it off, pour on more, and just keep repeating this. Scraping water is important in cooling your horse, otherwise the water will be trapped in the horse’s hair and will quickly warm up. Horses can sweat 15 – 20 liters per hour in cool, dry conditions and up to 30 liters per hour in hot, humid conditions. To order or find out more about the Dynamite products mentioned above visit my Dynamite website.